The Agony of Genetically Disrupted Melanocortin Receptors (MC4R). Defects in MC4R are a cause of autosomal dominant obesity, accounting for 6% of all cases of early-onset obesity (Farooqi et al., 2003). ... Experiments on rats have shown that a part of the brain called the hypothalamus helps determine how much food energy is stored, raising the possibility of a new kind of anti-obesity drug. Matthias Tschöp of the University of Cincinnati in Ohio used drugs that either stimulated or blocked receptors for the hormone melanocortin on hypothalamus cells in the brains of rats. Those given stimulatory drugs burned more of the carbohydrates in food, while those given inhibitory drugs converted them to fat and made extra fat in their liver (The Journal of Clinical Investigation). Tschöp thinks the receptors communicate with fat and liver cells through the sympathetic nervous system, which also controls heartbeat and digestion. The same system may exist in humans, he believes, because people with faulty melanocortin receptors are often morbidly obese. The paper by Nogueiras et al. (PDF freely available) contains this wonderful diagram of how blocking melanocortin receptors affects fat storage and metabolism. Figure 8 (Nogueiras et al., 2007). Schematic overview summarizing the physiological effects of CNS-Mcr blockade on peripheral tissues. 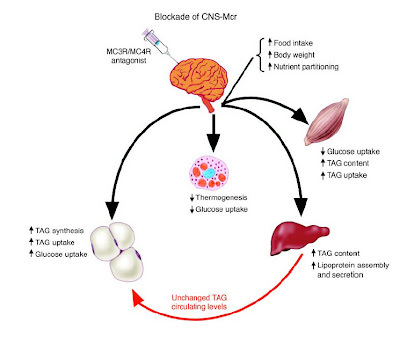 Blockade of CNSMcr decreases thermogenesis and glucose utilization in BAT [brown adipose tissue]; decreases glucose utilization in muscle; increases TAG [triglyceride] content, lipoprotein assembly, and secretion in liver; and increases TAG synthesis and uptake as well as glucose uptake and insulin sensitivity in fat tissue. Combined, these parallel metabolic changes in multiple tissues represent a synergistic shift in substrate choice and nutrient partitioning, resulting in increased energy storage. Adan RA, Tiesjema B, Hillebrand JJ, la Fleur SE, Kas MJ, de Krom M. (2006). The MC4 receptor and control of appetite. Br J Pharmacol. 149:815-27. Farooqi IS, Keogh JM, Yeo GS, Lank EJ, Cheetham T, O'Rahilly S (2003). Clinical spectrum of obesity and mutations in the melanocortin 4 receptor gene. N. Engl. J. Med. 348:1085-95. Nogueiras R, Wiedmer P, Perez-Tilve D, Veyrat-Durebex C, Keogh JM, Sutton GM, Pfluger PT, Castaneda TR, Neschen S, Hofmann SM, Howles PN, Morgan DA, Benoit SC, Szanto I, Schrott B, Schurmann A, Joost HG, Hammond C, Hui DY, Woods SC, Rahmouni K, Butler AA, Farooqi IS, O'rahilly S, Rohner-Jeanrenaud F, Tschop MH. (2007). The central melanocortin system directly controls peripheral lipid metabolism. J Clin Invest. 2007 Sep 20; [Epub ahead of print]. 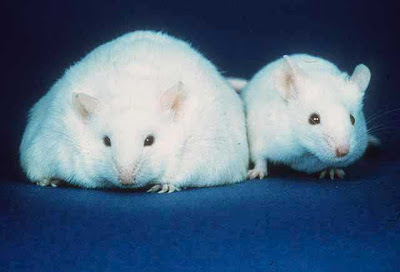 Disruptions of the melanocortin signaling system have been linked to obesity. We investigated a possible role of the central nervous melanocortin system (CNS-Mcr) in the control of adiposity through effects on nutrient partitioning and cellular lipid metabolism independent of nutrient intake. We report that pharmacological inhibition of melanocortin receptors (Mcr) in rats and genetic disruption of Mc4r in mice directly and potently promoted lipid uptake, triglyceride synthesis, and fat accumulation in white adipose tissue (WAT), while increased CNS-Mcr signaling triggered lipid mobilization. These effects were independent of food intake and preceded changes in adiposity. In addition, decreased CNS-Mcr signaling promoted increased insulin sensitivity and glucose uptake in WAT while decreasing glucose utilization in muscle and brown adipose tissue. Such CNS control of peripheral nutrient partitioning depended on sympathetic nervous system function and was enhanced by synergistic effects on liver triglyceride synthesis. Our findings offer an explanation for enhanced adiposity resulting from decreased melanocortin signaling, even in the absence of hyperphagia, and are consistent with feeding-independent changes in substrate utilization as reflected by respiratory quotient, which is increased with chronic Mcr blockade in rodents and in humans with loss-of-function mutations in MC4R. We also reveal molecular underpinnings for direct control of the CNS-Mcr over lipid metabolism. These results suggest ways to design more efficient pharmacological methods for controlling adiposity.